Home Commentary What will the federal reserve do if…? The purpose of this spotlight is to flag one of the potential spoilers for the housing recovery over the next few years: above-trend economic growth that fuels an escalation in the inflation and interest rates. We seem to have arrived at an inflection point. A few years ago, the Federal Reserve (Fed) was concerned about slow growth and deflation. 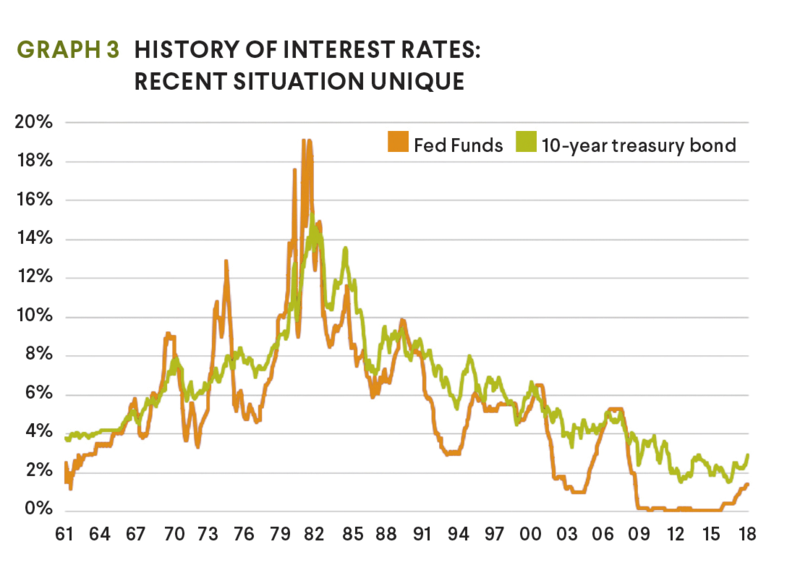 As a result, Fed policymakers cut interest rates to zero and started purchasing government long-term securities to drive long-term interest rates lower as well. The Fed’s concern is now correctly focused on how to avoid excessively high economic growth that might push the inflation rate above the desired target of 2% per year. The Fed has announced a plan that they believe will achieve that goal. The first part of the plan calls for three or four quarter-point increases in the federal funds rates in 2018 to be followed by a pair of quarter-point increases in 2019. The plan assumes that economic growth will be slowing in 2019 as will be discussed below. The Fed has also announced plans to unwind the massive purchases of longterm assets called Quantitative Easing (QE). After interest rates hit zero, the Fed had to take further action to insure that the financial system was on a solid recovery footing. The Fed has never purchased this amount of long-term assets before. It acquired about $4 trillion in long term assets that helped build up banking reserves, and lower long-term interest rates were another bonus. The stimulus efforts worked and the economic recovery was on solid footing in 2017. Economic growth is now likely to be very healthy in 2018-20, but a bit more than what the Fed believes is sustainable without triggering inflation. Even though economic growth looked solid and unemployment was near 4%, the Trump Administration chose to provide additional stimulus. The recent tax legislation cut personal and corporate taxes, and policymakers are still proposing higher expenditures on defense, a border wall, and infrastructure improvements. What drives the inflation process? Economists have studied the root causes of inflation extensively. Generally, they agree that it is a monetary-driven process, where excessive money supply growth fuels the inflation process. There was a short period when the Fed actually tried to set policy goals based on the growth in the money supply. This approach was abandoned by Chairman Greenspan—in part because the internet and computer technology changed how transactions could be made. There is no longer an accepted definition of the money supply for that simple equation. The lack of a trackable money supply makes it more difficult for the Fed to determine when an inflation problem is brewing—they are flying the economic ship with one important guide missing. Instead, the FOMC primarily uses interest rates and economic growth as their primary monitors. But they have to be concerned with the excess reserves that were put into the banking system with the QE process. Since this has no historic precedent, it is not clear how much fuel there is for excessive growth in the next few years. What is trend economic growth potential? The question is what might be excessively high growth? This is why the assumed trend growth from the FOMC survey is so important. Their view of trend capacity growth of 1.8% appears to be fairly reasonable. Because we have become primarily a service economy, trend capacity growth is determined by two factors; growth in the labor force growth and the growth in output/manhour or productivity. Their trend GDP growth of 1.8% is consistent with labor force growth of 0.6% per year and productivity growth of 1.2% per year. Using the most recent Census forecast of population, 0.6% growth in the labor force seems reasonable. But this was before the Trump administration clamped down on immigration. The cut in immigration will hit the younger age groups particularly hard. There is already a problem with the labor force growth for ages under 25 with an immigration rate of 1.2 million per year. Most immigrants are under age 35. A 50% cut in immigration will reduce labor force growth to 0.3% over the next 5 years and an even bigger problem for young entry workers. A few factors could mitigate this outlook, for instance higher participation rates for younger males or deferred retirement of the Baby Boom group. The productivity assumption also seems reasonable. Longer term productivity growth has moved between 1-3%. The longer-term average is close to 1.5%, but for the last 7 years productivity growth has been only 0.9%. Because of the historic average and the large swings over time, there is a room for a lot of disagreement on what the productivity trend will be. The Trump Administration believes their tax cut for corporate profits will boost investment and productivity. That might be true after 2020, but it is unlikely in the next few years. The economy is so large that an increase in investment over a few years has a very small impact on the overall capital stock being used. The next question that the Fed must address if economic growth does move to or above 3% for the next few years is: How much slack is there in the labor force? Despite the dramatic drop in unemployment over the last 8 years with economic growth of only 2% per year, wages have not moved up aggressively in the last few years, as many of us had expected to happen. There was plenty of slack, and some discouraged workers have returned to the labor force. But there are signs the slack is nearly gone. 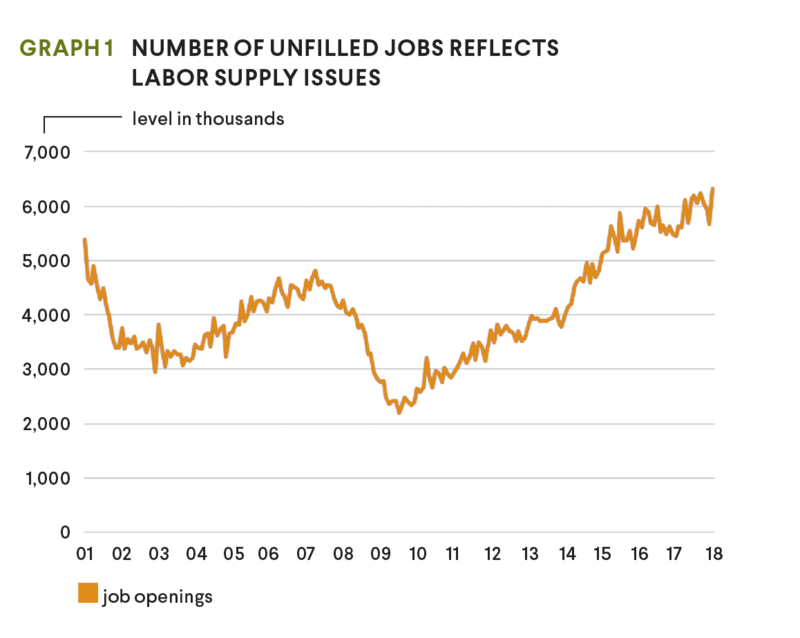 As seen in graph 1, unfilled jobs are now extremely high—far above the 2001 and 2007 peaks. The recent Small Business survey has moved finding qualified employees up to their number one problem. Another data series—the number of unemployed individuals plus the adults not in the labor force but would like a job—is now down to 12 million from nearly 22 million in 2010. The lowest this series has been was 10 million in 2001. So, if GDP growth hits 3% or above and unemployment drops to 3.5% or lower, then the long-awaited acceleration of wages should finally get underway. Will international supply keep U.S. inflation under control? One thing that helped keep U.S. inflation low over the last few years was the availability of offshore goods at attractive prices. We won’t be able to count on that over the next few years. First global growth is quite healthy now. For the first time in over 10 years, most major economies are growing. Second, the Trump Administration is threatening to put tariffs on a range of goods and redo trade agreements. They are beginning to go after a range of Chinese products. The Chinese are starting to retaliate as well. Finally, the U.S. dollar has fallen over the last year, in part because our trade deficit has grown. Some expected the dollar to strengthen after the tax cut, which did not happen. A recent Wall Street Journal addressed some of our concerns about a revival of a serious inflation problem. Since inflation has not been a threat in recent years, it is easy to forget just how harmful inflation can be and how quickly inflationary pressures can build. The history of inflation rates back to 1960s is shown in graph 2. The overall consumer price index (CPI) and the Personal Consumption Expenditures (PCE) are shown. The FOMC members survey reflects the PCE. They prefer this index, because it is much less volatile than the overall CPI because this version excludes energy and food prices. For instance, the CPI pushed up to 14% in the 1970’s because of oil price surges. As seen, the PCE only hit 10%, but it also did not go negative when oil prices collapsed. 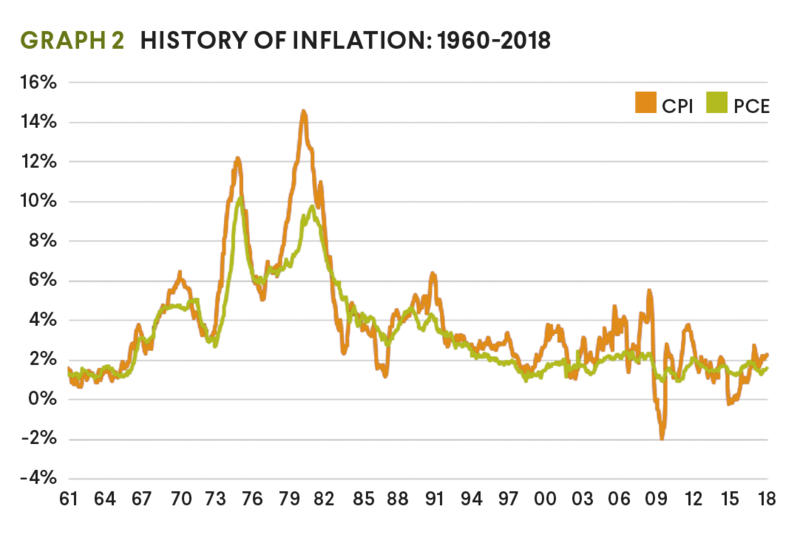 Inflation built momentum in the late 1960’s due to aggressive fiscal policy actions (the Vietnam War and funding the Great Society under President Johnson), plus an accommodative Fed. The combination of easy monetary policy and fiscal stimulus pushed economic growth beyond the underlying trend growth and resulted in a surge in inflation. By 1970, inflation had shot up to 6%. The Boom-Bust cycles in housing starts followed as Fed policies acted to slow growth and inflation after large interest rate hikes. As seen in graph 3, they also cut rates aggressively when the economy slipped into recession and housing starts plummeted. As growth rebounded, so did inflation. Finally the Fed pursued an extremely aggressive policy that caused the serious recession in 1980-82. Mortgage rates shot up to 17.5%, housing starts plummeted as did economic growth. But it worked. Inflation then trended down for the next 30 years. Second, after the extended easy monetary policy, the financial system is currently awash in liquidity. Third, the Trump Administration has cut taxes and is also boosting spending on defense, a border wall and infrastructure spending. This is a stimulus that was not really necessary with unemployment at 4%. The budget deficits are set to top $1 trillion over the next few years as part of the effort to make America Great Again. Finally and perhaps the most important concern raised in the WSJ article is that inflation acceleration tends to move up exponentially once it gets underway. That certainly was the case in the late 1960s. Are we about to embark on an inflationary period again? At this point, it is highly unlikely that policymakers are going to allow a repeat of the 1970’s to happen. But there are some scary similarities to what happened in the late 1960s as mentioned above. Unemployment has been low for years. The administration has not started a shooting war, but they have put in place a big fiscal stimulus package and are on the verge of a trade war. In this scenario, economic growth moves above 3% for the next few years. Assuming labor force growth below 1% and productivity growth near 1.2%, unemployment could even approach 3% in 2019. Inflationary pressures would then heat up. Inflation could approach 4% by the end of 2019, which would be significantly above the Fed’s desired goal. If so, the Fed would revise the number and even the size of interest rate hikes in 2019 in order to slow growth. Given historic lags to monetary policy and inflation, the Fed would also have to keep boosting rates in 2020. Bottom line: The U.S. economy is currently moving into uncharted waters. The collapse in the global economy in 2008, led to monetary policy actions never taken before by the Fed. Without historic guide posts, it is extremely difficult to forecast the exact path for inflation and interest rates. The recent stimulus package, restrictions in immigration and potential trade restrictions add even more uncertainty to the mix. Higher financing costs are not the only concern, there is the potential for a significant drop in product demand along with falling housing starts in 2020-21 if mortgage rates push above 6%.